FleetAfrica (a division of Super Group Africa (Pty) Ltd) applies inter national fleet management best practice to its operations, and utilises leading managemen t information systems and tools to assist customers in making their business models mor e efficient, and profitable. The company’s experience, infrastructure and general fleet management exper tise form the foundation of an effective, structured enterprise and supplier development programme, which operates within the context of the FleetAfrica value chain to o pen up economic opportunities to previously disadvantaged entrepreneurs. FleetAfrica is proud to have assisted numerous black entrepreneurs in setting up and managing sustainable businesses within the fleet management industr y. 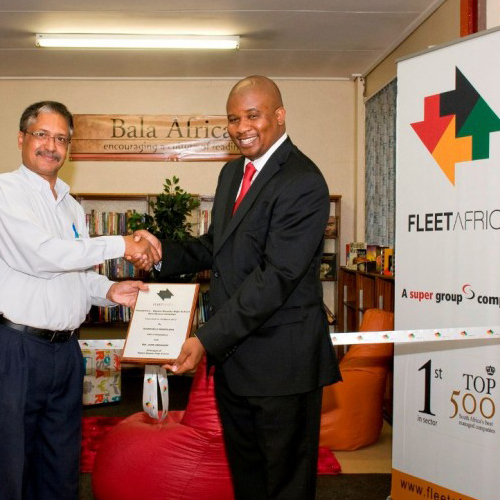 To date, the FleetAfrica enterprise and supplier development programme has benefited more than 10 previously disadvantaged entrepreneurs, including: Lunganosi Vehicle Inspections, Keyame Logistics, Africa Best Fleet Solutions, Peu Petrolium, Orban Printers and Abonhlane Consulting. Services sour ced from these businesses include vehicle condition auditing, the pr ovision of vehicle registration plates, vehicle licensing, vehicle inspections, vehicle branding, vehic le delivery, vehicle maintenance, after-market fitments and human resources support.